The Whitaker Wellness Weight Loss Program was written by Julian Whitaker, MD, and is based on the real-life experiences of thousands of patients who have been treated at his clinic, The Whitaker Wellness Institute. Dr. Whitaker is the author of 13 books including Reversing Diabetes, Reversing Heart Disease, and Reversing Hypertension. Whitaker acknowledges that excess weight is a big problem in America and he says that he has seen it in his patients as well as struggling with it personally. When he discovered a program that helped his patients, and himself, to lose weight and keep it off he realized he had to share it, which is the reason why he wrote this book. The Dr. Whitaker Diet discusses how carbohydrates, fats, and protein affect appetite and weight. For maximum fat burning he recommends a diet that is low in carbohydrates, high in protein and moderate in fat. The diet consists of three main meals daily containing approximately 20-25 grams of protein and 10 grams of carbohydrates. Dieters are also allowed one or two smaller snacks daily. One light beer, 1 glass of dry wine or 1 oz spirits is also permitted. The book includes three weeks of meal plans and a selection of recipes. There is also a website designed for readers of the book to provide additional support and encourage accountability through features such as exercise logs, food diaries, calculators and extra recipes. Fruit, low-carb vegetables, eggs, turkey, chicken, lean beef, salmon, shrimp, tuna, reduced-fat cheese, cottage cheese, tofu, Boca burgers, endamame, flaxseed, peanut butter, almonds, sunflower seeds, V8 juice, olive oil, coconut oil, stevia, xylitol, coffee, tea. Exercise is during the Doctor Whitaker Diet emphasized because it increases calorie burning and helps to build lean muscle, which increases metabolic rate. A combination of aerobic exercise, resistance training and stretching is recommended. The book includes descriptions of a variety of basic exercises to get you started. The Whitaker Wellness Weight Loss Program retails at $24.99. 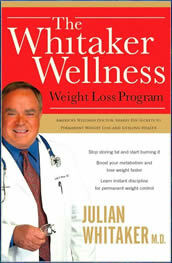 Dr. Julian Whitaker is a qualified and well-respected health practitioner. Emphasizes the consumption of a variety of whole foods. Encourages the intake of foods rich in essential fats. High protein intake can reduce appetite and maintain muscle while calories are restricted. Includes three weeks of menus with recipes. Advocates the use of supplements for fat burning and muscle gain. Some of the Dr Whitaker’s conclusions have not been evaluated by independent sources. Encourages daily intake of alcohol and caffeine. The Dr.Whitaker Wellness program is another example of a high protein, low carbohydrate diet. These approaches to weight loss are generally very effective in the short term, however when dieters return to a more balanced eating plan they generally experience rebound weight gain.